When the student-funded transit agency at the University of Montana purchased two electric buses in 2016, it made the school the first major university in the country to operate the fast-charging buses. Now, the UDASH transit system will add three more electric buses to its fleet, thanks to a $1.5 million grant from the Federal Transit Administration and its Low and No Emission Bus Program. The latest grant marks another step in the transit agency’s efforts to phase out diesel fuels. Those old buses, which consumed 26,000 gallons of fuel each year, were often criticized as being dirty and loud as they rumbled through various neighborhoods. Manufactured by Proterra, the new buses offer battery packages that recharge in 10 to 90 minutes and provide a range of up to 150 miles. While operating a diesel bus costs around $1.03 per mile, the electric buses cost 19 cents per mile, according to Proterra. While the buses cost around $740,000, the reduction in fuel costs net an $89,000 savings over the life of each vehicle. They also cut carbon emissions by several hundred tons. 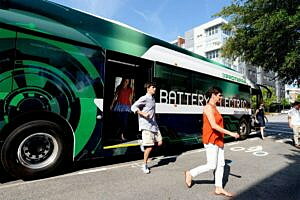 Hess said the new electric buses will allow ASUM to replace several diesel buses that have exceeded their useful life. Nearly 400,000 passengers use UDASH each year, Hess said, and more than 15 percent of students ride transit to campus. ASUM expects to order the buses this fall and receive them sometime in 2020. Earlier this year, Mountain Line also landed a $2.7 million grant to purchase electric buses. The funding will enable Mountain Line to replace three of its oldest buses with fast-charging electric buses. Those buses are expected to come online next year.